Shelley Speet Mills was 19 years old and had been married for 17 days when she was stabbed 32 times. Her slaying the morning of Sept. 15, 1970, in her apartment at 314 College NE, was the first in a series of homicides known as The Heritage Hill Murders. 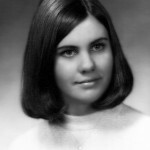 It’s been almost 46 years and police—while they know a lot—still cannot name her killer. It’s not for lack of trying. A new film about the case premiered Sept. 14 at Wealthy Street Theatre in Grand Rapids, MI. The 75-minute film chronicled the crime, investigations, the story of Shelley’s life and her family, and the impact of the crime on her loved ones and the community. And though the case is approaching half a century unsolved, that doesn’t mean it’s closed. There is no statute of limitations on murder. “That never tolls,” said Schock. “The reason is because this is the most serious of crimes. And unsolved homicides leave marks on their communities. They represent unfinished business. In fact, Shelley’s mother, Vesta Speet, went to her grave without knowing who killed her daughter. She died in 2012 at age 94. Schock of Grand Haven often works with Hamilton videographer Phil Blauw. Together they have made several other murder-related films including Who Killed Janet Chandler?, Jack in the Box, Finding Diane, Murder on the Third Floor: The Killing of Mina Dekker (long-form interviews), Into the Dark: The Murder of Shannon Marie Siders, and Death of a Phoenix: The Eastown Murder of Joel Battaglia. Police have solved most of the cases the pair have chronicled. Their murder films are emotionally and physically demanding. And expensive to make. “There is no underwriter for this work; it comes out of our back pockets,” Schock said. Posted on Monday, January 26th, 2009 at 5:06 pm. Last updated on Wednesday, September 14th, 2016 at 3:12 pm.